When on holiday, I like to maximise my time. This means planning everything out in advance so I don’t have to think about what to do when I’m actually on vacation. So of course, I’d planned out each day of my “relaxing” beach holiday in the Seychelles. We were staying in Praslin (pronounced Prah-lin) for 4 nights and I knew I wanted to do a day trip to La Digue. 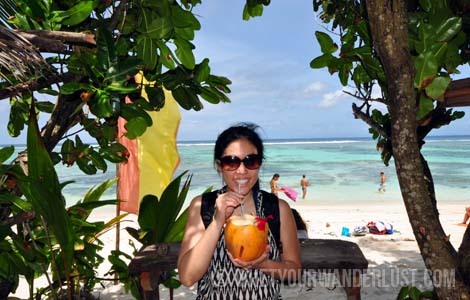 After reading a number of reviews, I arranged for a guide I found on TripAdvisor to take us on a tour of the small island, including a hike to one of the harder-to-access beaches. I contacted him by email and after a number of exchanges, organised for him to meet us at the jetty in La Digue one Saturday. The catamaran from Praslin to La Digue takes only 15 minutes, but as there are only 4 morning departures Monday to Saturday, I booked the tickets online to make certain I’d be on that very first ferry at 7am. It cost €27 per person, which was more than what I’d have paid had I just rocked up on the day, and I soon realised that I could have waited to buy my ticket as there were few people were as keen as me to take that early morning ferry. (Though I may have been in a mild state of panic as the tiny ticket office with the single chilled-out attendant didn’t actually open until about 6:55am.) Good morning from Baie Sainte Anne! But when we arrived to La Digue at 7:15am, our guide wasn’t there! Nor was he picking up his phone. We waited around for a while. Each time we saw a local nearby, we thought he might be our guy. We asked around for him (since the island only has 2000 residents) but no one seemed to know who he was. So much for my planning. La Digue is a compact 10 square km island, and it seemed that everyone was still sleeping when we arrived. There’s a relaxed vibe and one narrow, single lane off the jetty made of brick. The main mode of getting around is bicycle so you see both locals and tourist alike leisurely cycling from point A to point B. Right off the jetty there’s a Tourist Information Centre, but it didn’t open until 9am. So we decided to grab breakfast while waiting for the Tourist Information Centre to open, then rent bikes for the day and explore on our own. We walked to the left of the jetty (north of La Passe) for 500 metres and came to Le Domaine de l’Orangeraie, rated as one of the top hotels in La Digue. The hotel restaurant is right on the water, so we decided to partake in the breakfast buffet. 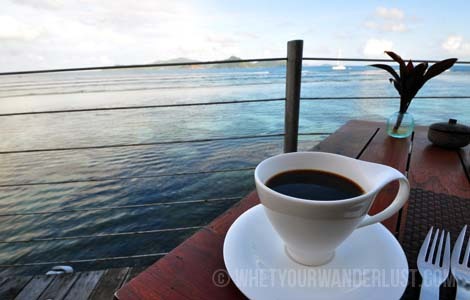 We were among the first to arrive and had our choice of seats, and since we no longer had a schedule, we leisurely enjoyed our most memorable breakfast of the trip, overlooking the Indian Ocean with Praslin in the distance. The best way to start the day. 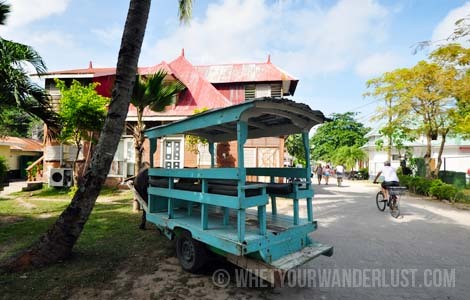 Hire bicycles, cycle to the Union Estate, an old coconut plantation. 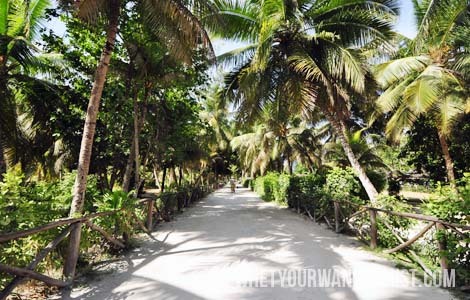 Walk from there to the famous Anse Source d’Argent, known as one of the most beautiful beaches in the world. 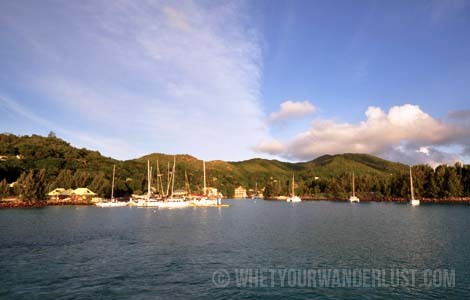 Cycle up to the centre of Praslin – a viewpoint cleverly named Belle Vue. Then cycle to another well-known beach in the southeast of the island, Grand Anse, before taking a late afternoon ferry back to Praslin. The island is quaint. You see the odd oxcart, though I think it’s mostly for the benefit of the tourists. 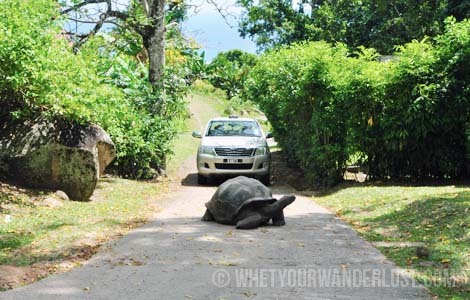 To get to the Anse Source d’Argent, you have to go through the Union Estate, where you’ll find a vanilla plantation, copra mill, a colonial cemetery, some old houses an a pen overflowing with giant tortoises. You see amazing beaches flanked by stunning granite boulders that you’ve only ever seen before in photos. You feel like you could be in a flooded Petra. 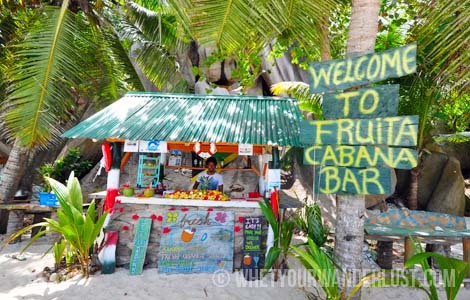 Right off one the Anse Source d’Argent, there are two chilled-out juice stands competing with one another for business and giving out free samples of their fresh juice concoctions. That, I wasn’t expecting to see, but I still enjoyed my fresh coconut against the backdrop of one of the most beautiful beaches in the world. You stumble up on random giant tortoises on the road. 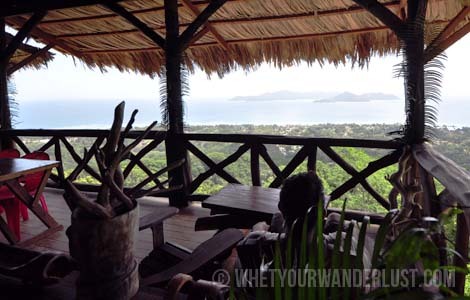 You “discover” a random café at the top of the island serving beer and more fresh fruit juice. Sometimes it’s nice when things don’t go exactly to plan. 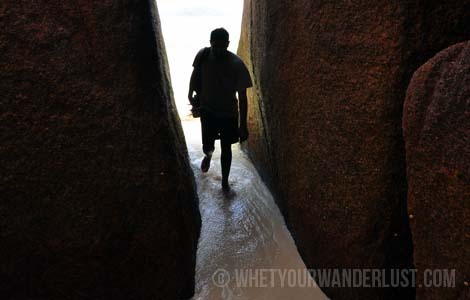 Though we’d intended to get off the beaten track and visit some remote beaches with a guide, it was super-easy and perhaps even more memorable to explore La Digue on our own. La Digue was the definitely the highlight of our trip to the Seychelles, and for us, one day was the perfect amount of time to see everything we wanted to see. 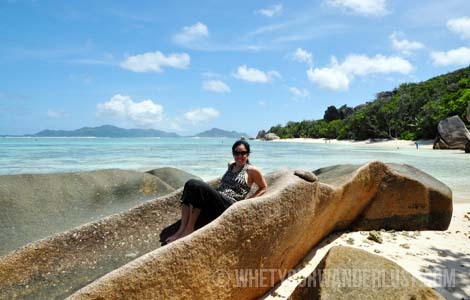 In total, we stayed 4 nights in Mahe and 4 nights in Praslin, with a day trip to La Digue. I purchased ferry tickets from Seychellesbookings.com.